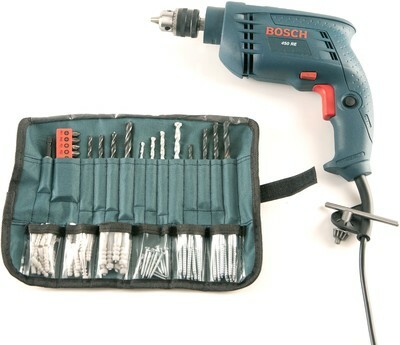 Bosch GSB 450 RE Carton Drill Kit is one of the most common drill kits and has always satisfied the users. The surfaces like metal pole, concrete, or wooden surface can easily be drilled on. Bosh is of high quality and designed specifically for professional touch and that too without being trained. 1)It is ideal for any kind of usual household and office usage. 2)It is very light weighed and compact. 3)It enables hassle free drilling. 4)The impact rate is about: 0 – 41600 bpm. 5)The power input is about 450 W.
1. Drill Kit- which consists of several kinds of drills according to the surfaces. 2. Hammer Drill-is useful for drilling efficiency. 3. Portability-It is very handy and can be easily carried anywhere. 4. Power-It uses 450 w of power. 5. Screwdriver- It can also be used to insert the screws. Bosch GSB 450 RE Carton Drill Kit is a high performing drilling machine. The product is purchased mostly because of its brand value”bosh” which never disappoint. The drill has got a heat-dissipating mechanism which is very helpful for long usage. The drillers can be chosen according to the surface to be worked upon. The five star rated product has got many satisfied reviews which is enough to inspire you for purchasing the product. Bosch GSB 450 RE Carton Drill Kit is a worldwide accepted product for drilling, usage. The product is recommended because of its high usage. You can go for it, if you are looking for quality and assurance.